Started rolling out MS office 2013 to Users few weeks ago.For this ,created collection to get computers with MS office 2010 ,created application for MS office 2013 upgrade and deploy to collection .This collection consists of computers from different departments,business units etc. Colleague of mine asked me if there is way to get report for deployment status of specific application for specific OU. The reason for this requirement is that ,he wanted to get the deployment status per business unit (location)for the deployed application. OUs in AD are named with location names . A single collection (MS office 2013 upgrade ) consist of computers from several business units and he wants to see the status per business unit for reporting. The default report ‘All Application Deployment (basic)’ from software distribution—Application monitoring category works on specific collection and this collection contains the computers from different business units (Locations which are nothing but OU’s ) did not work for this requirement. Must create new report to get the deployment status results for specific application for specific business unit. So I started looking out for the Configmgr 2012 R2 SQL tables/sql views using the Configmgr 2012 R2 SQL views spread sheet . I created report which can be used to find the deployment status of any application (but not packages) for specific OU. Note: This report will list the computers on which the deployment ran or atleast the computer received policy about the deployment. For ex: An OU contains 200+ computers but the collection contains only 50 Computers from this specific OU so when you run this report,you may only see results for these 50 computers but not 200+. Also remember that,this report will not give you the error description for the computer when did the deployment is failed . It requires little more work to get the description from dll files in SSRS and will update this post when am done. When you run the report ,you will have to select the OU ,you will see list of all OU’s from your AD .It may look ugly with all OUs and sub OU etc but you can fine tune the SQL query this to get the child OU only. 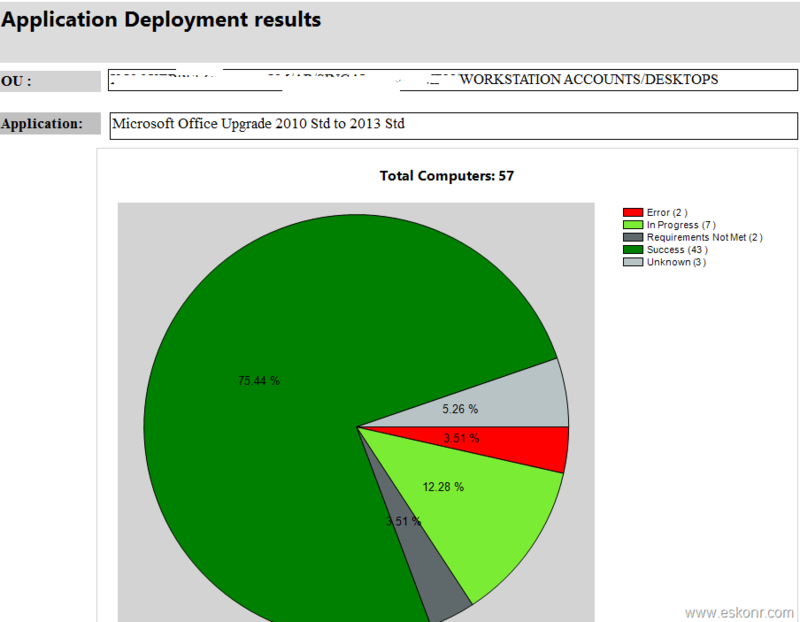 This report contains 2 sub reports 1)Overall deployment status results with nice pie chart for specific application for specific OU 2) sub report to get the list of computers with specific specific for the selected application . Download the RDL files from TechNet gallery here ,upload the RDL files to your SSRS Folder (keep both these files in same folder as they are linked),change the Data source and run it. 37 Responses to "SCCM Configmgr 2012 Report Application Deployment results for specific application for specific OU"
with this 3 status kindly help me for this query creation, i have tried lot but i am not able to create the query. All this information you can get it if you are on Configmgr current branch 1802 and above .There is pending restart column available for clients . Hi Eswar i need to create the report and its publish in dashboard actaully we have many collection and software update group so i have compainded all system in one collection i need the last enforcement report for that collection please help me. i have already created the query for one system but not able to create for collection kindly help me. When running the report it says "OU is missing a value"
Which report you have issues ? is it linked report or parent report ? if you are running linked report directly ,it wont work as the prompt is hidden and it comes from its parent report. Please pardon my stupidity but, I am kind of new to SCCM. Can you please guide where is SSRS folder located and how to change the data source. Do you have any idea on how to get top 25 successful deployment of Apps and packages. You can get but what do you mean by top 25 successful ? is it based on the number of success or success% of the deployment . I tried it ,it works for me .Can you edit the RDL file for SQL query and try it in SQL server management studio. Can you double-check your query please ? I just ran the report ,it works fine for me.What error do you get after running report ? Below is the SQL used in the report which might help you to run in SQL management studio. Add Displayname and OU in the SQL query before you run. Can this SQL report be modified to get the specific Collection ID instead of OU ??? yes you can modifiy the OU with collection .all you need is resource ID from v_fullcollectionmembership but there is already default reports for collection. Once again Thank you for all you do !!! Here is the modified SQL query ,you can take this and customize in SSRS. I dont see any default reports in our environment to check the status of an application , We have reports to check the status for packages . Can you tell me how to import them in sccm .Also i need a seperate report to check the status of both applications and packages . What version of SCCM are you running ? if you are on CM12 and above, there are some default reports with category 'Software Distribution - Application Monitoring' . To import this report, download the RDL file, upload to your SSRS report folder ,change the datasource and run the report. Thanks Eswar for the reply , We are currently running SCCM 2012 R2 , where can we download those reports(RDL files ) . I am pretty new to reporting . Run the Configmgr reports URL ,configmgr_sitecode ,look for category 'Software Distribution - Application Monitoring' . If you do not see it ,check with your Configmgr admin for this default reports. I see "All application deployments (advanced) " report under "software distribution - application monitoring " but it does not give any results , I need a report which gives me the status of the application .I am not sure if we have reports which we can import or do we need to write it completely. . I also need a report which will give status of a machine for both applications and packages as we use applications and packages , Default report "All application deployments (advanced)" will not provide any time stamp . For applications and packages ,they work altogether differently and their SQL tables/views also different .You already have default reports for both packages and application status. It works good for me and others as well. Do you have any applications at all and are they deployed to clients ? if you have ,can you check the apps from view called dbo.fn_ListApplicationCIs(1033) ,The prompt used in the report is pulling the information from this view. You can open the RDL file using report builder ,take the SQL query used in dataset called App and try the Query in SQL management studio. Do you known, how to obtein the results, when a deployment was eliminated?? what do you mean by eliminated ? Removed ? if so ,you cannot get the status for removed deployment. you can add installeddate0 from v_gs_add_remove_programs? installeddate value stored from this view. have you tested this ? for me it cannot work as it does not exist a relationship between the application and the software , how are you linking all together ? what do you mean by application and software ? This report only works for Applications but not for package(legacy). If you do not see any applications in the prompt, Open the RDL file using report builder or visual studio ,try the SQL Query used in App dataset into SQL Server management studio. Take a look at the SQL query to understand the linking and how it works. ok,got it. Nope,this report will not tell you when was the application installed since,Application deployment evaluation cycle will run as per the schedule and it always report success if install already .So the best way would be to query it from v_add_remove_programs if install date exist in this view. Any chance you have this for collection based? application deployment status report for collection based is available in default reports. have you looked at report --->All application deployments (basic) under category Software Distribution - Application Monitoring ?